"COOKING FROM HEART" is born from unleashed creativity triggered by boredom and ideas turning the once dreaded chore into timeless pleasures past-times. 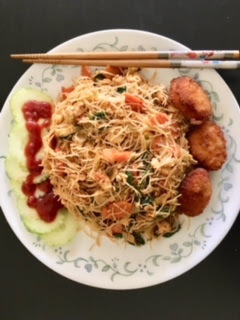 As many would have know that I'm basically from the South East region and I tend to love Asian Cuisine using sambal paste most of the time preparing noodles. Sambal paste are commonly used as foundation for so many Asian Cuisine and a condiments to e served at the table. Back at my home theres used to be batches of Sample paste bottled up for Future usage. Here I prepare fresh ones whenever I crave for my hometown badly missed food like -" NASI LEMAK, BEE HOON< FISH BALL NOODLES , CURRY NOODLES !!! " Well I tend to go head over heels for noodles. What's Sambal- a common question asked by many a whenever I mention them. Sambal are basically dried chilies either pounded, pureed or finely chopped with shallots garlic and incorporate with wide range of ingredients like shrimp paste, palm sugar, lemon grass and many more according to your style of preparation methods or you tastebuds. You can never find authentic recipe for Singapore Fried Bee Hoon. It depends one each tastebuds and preparation methods. 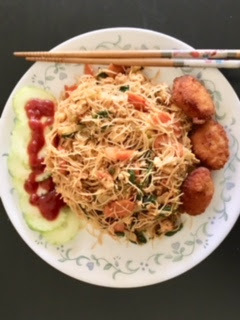 Normally the vermicelli is presoaked in water and drained but I like to blench them in hot water for few seconds to get a softer texture- then stir fried with onions, minced garlic with your choice of meat or veggies ( bean sprouts is must to get the really taste of Asian Style Noodles ) and common seasoning like soya sauce, oyster sauce, rice wine, sesame oil, chili and tomato sauce. 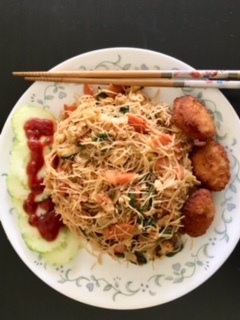 The following recipe this how I normally love to cook my noodles accordingly to my family tastebud. 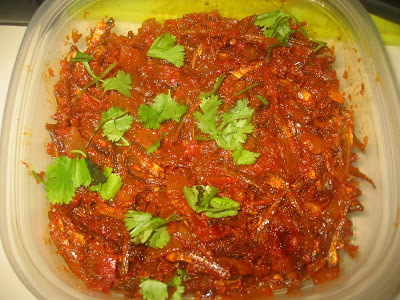 Just enjoy my home made version of Spicy Sambal Bee Hoone from Taste of Saras to your dinning table!! Time to get back to my normal routine. Till my next post keep tabs on my blogs for more recipes guys. See ya soon with another recipe from my kitchen !!! Bring a pot of water to boil and blench the vermicelli unit soft. Rinse with cold water and set aside. Mix the chicken and prawns with like salt, cornflour. pepper and soya sauces- marinate for few minutes. Heat heavy bottom wok with couple spoons of oil. Sauté the sliced onion and garlic til cooked. Add the cabbage and carrots and stir-fry for 2 minutes. Push all the ingredients to the side of the wok. Add some oil and scramble the eggs until cooked and push back the vegetables and mix well. Add the the vermiceli and the bean sprouts. Sauté for few seconds and add the chills paste and seasoning ingredients. Stir fry it'll well cooked. Transfer to serving plate garnish with chopped green onion leaves.